The average cost of a new let rose to £953 pcm, up 1.3% year-on-year in May. 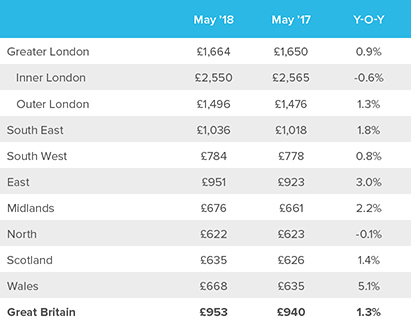 The Hamptons International Lettings Index reveals that the number of rental properties used as a second home has been steadily rising since 2007 when its records first began (table 1). Last year there were 136% more rented second homes than in 2007 when there were just 5,800. This is also up 11% on 2016. The average rent of a second home reached £1,060 pcm in Great Britain last year. This is 24% more than the average rent of a primary home in Great Britain. In London this rises to £2,030 pcm with many second home renters using their London rental property as a pied a terre. London has the third highest proportion of rented homes let as second homes, behind the South West in first place and Scotland in second. 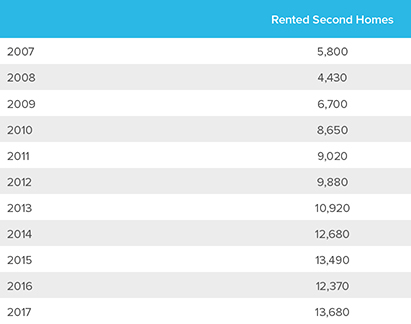 Six out of the top 10 second home rental hotspots are located in the South East or South West. (table 2). 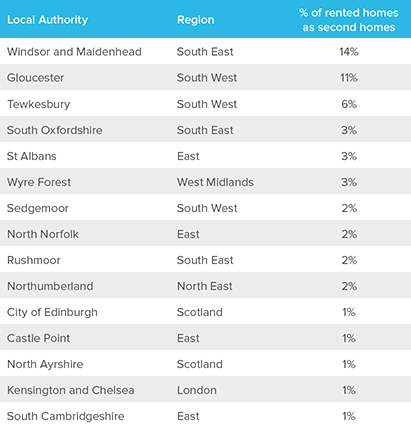 Windsor and Maidenhead top the list, with 14% of rental homes let as second homes. The more rural areas of Gloucester and Tewkesbury in the South West follow with 11% and 6% of rental homes let as second homes. The average cost of a new let rose to £953 pcm, up 1.3% year-on-year in May. (table 3). However, the pace of rental growth slowed from 1.9% in April. Average rents in the North marginally for the second consecutive month. Meanwhile rental growth in London also slowed to 0.9%, driven by year-on-year falls in average rents in inner London. “The number of people renting second homes has reached a record high. The additional stamp duty surcharge on second home purchases introduced in April 2016, increased buyers’ upfront costs and resulted in more people deciding to rent a second home rather than buy. “The places second home renters are choosing include a mix of town and country. Second home rental hotspots reflect today’s lifestyle choices from the pied a terre in towns and cities, close to work, schools and all the amenities that city life has to offer, to rural and coastal locations perfect for escaping the trappings of a busy urban life.